Spokane's East Central neighborhood is located just east of Division street and north of Sprague avenue, a stretch of mostly flat land that tapers into the Spokane valley as one moves east and winds up a rocky basalt hill as one goes south. It is one of the oldest in the city, established as a working-class street-car suburb during the rapid growth of the 1890s after decades of use as farmland. The families that settled there, who supported themselves working in mining, logging, timber, construction, or the railroad for the most part, were drawn by scenery and views comparable with the more affluent South Hill and easy access to downtown and the railyards in east Spokane. Many were relatively recent immigrants of a variety of extractions, which made the neighborhood the most diverse in the city from its inception. There was, like the South Hill, a clear social strata as one ascended the heights, as those with greater means built larger homes on basalt lots that looked out over the broad expanse of the city. While mining magnates, railroad financiers, and timber barons built palatial homes in Browne's Addition, Nettleton's Addition, and the South Hill, wage earners lived much more modestly in the East Central neighborhood. The financial growth that prospered the neighborhood did not last long, though. By 1920, the local economy was mired in a post WWI slump that cut deeply into all of the core industries. As work dried up, East Central slid into a slow deterioration exacerbated by the Great Depression, which choked off the most of the remaining demand for minerals, timber, wheat, and commercial rail transportation. As families left to re-establish lives elsewhere, property values fell, attracting poorer residents and some of the less savory element. Although East Central experienced a brief revival during the WWII years and shortly after, by the 1950s it had become known as one of the poorest neighborhoods in Spokane, along with West Central and Hillyard. Still, East Central remained home not just to thousands of families, but hundreds of businesses from grocery stores and pharmacies to light industrial concerns, which employed many of its residents. The struggles of the previous decades had left a robust, if less well-off, community. Throughout this period, the cornerstone of East Central's micro-economy was its business district located along Sprague avenue, which had been the main driving route in and out of Spokane since it linked to Washington State's first cross-state road, Route 10, in the 1920s. Families who lived in the neighborhood typically traveled north, down the hill, to patronize the Sprague District's shops and grocery stores, which kept the lower part of East Central vibrant and populous. The Sprague avenue corridor acted as an anchor of sorts, binding the neighborhood together despite the apparent financial disparities, and maintaining a coherent and cohesive community that had weathered the century's financial storms remarkably well. Ironically, the most serious blow to the East Central neighborhood was dealt in the name of progress. As the regional economy recovered after WWII and into the 1950s, and people began to travel and spend, it became clear that Sprague avenue could not handle the volume of traffic to which it was subject day in and day out. Worse yet, because the shipping industry had moved a significant amount of its business to road travel, large trucks and other delivery vehicles clogged roadways further. This was a problem common to many cities all over the United States, and it motivated the passage of the Federal-Aid Highway Act of 1956, the chief aim of which was to "authorize appropriations for the continued construction of highways," which its authors deemed so "essential to the national interest" that a network of freeways should "be brought to simultaneous completion" by 1969 or sooner. To do this, the Act authorized the Secretary of Commerce to "take possession of such lands or interests in lands by purchase, donation, condemnation, or otherwise in accordance with the laws of the United States." 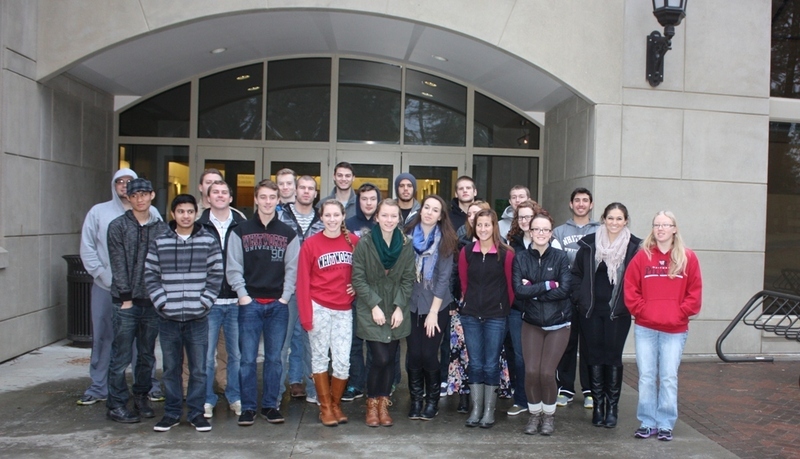 While the idea seemed promising, the results were a mixed bag, to say the least. On one hand, a national system of highways facilitated the growth of industry and stimulated economic growth. It also provided Americans easy travel to once more arduous destinations. In Spokane, for example, the freeway linked more distant areas, like Liberty Lake, to the downtown area, which spurred the development of businesses and suburbs that could not have thrived otherwise. Moreover, because it connected once disparate parts of the city, Spokane shed some of its provincialism and attained a more metropolitan status. There is little doubt that many benefited, but for the residents of East Central, the effects were devastating. After all, I-90 had to go somewhere. Of the three proposed routes - one winding over the South Hill, one travelling through the relatively flat lands north of the Spokane River, and the last cutting through the East Central neighborhood - the East Central option won early favor. It is not hard to understand why. 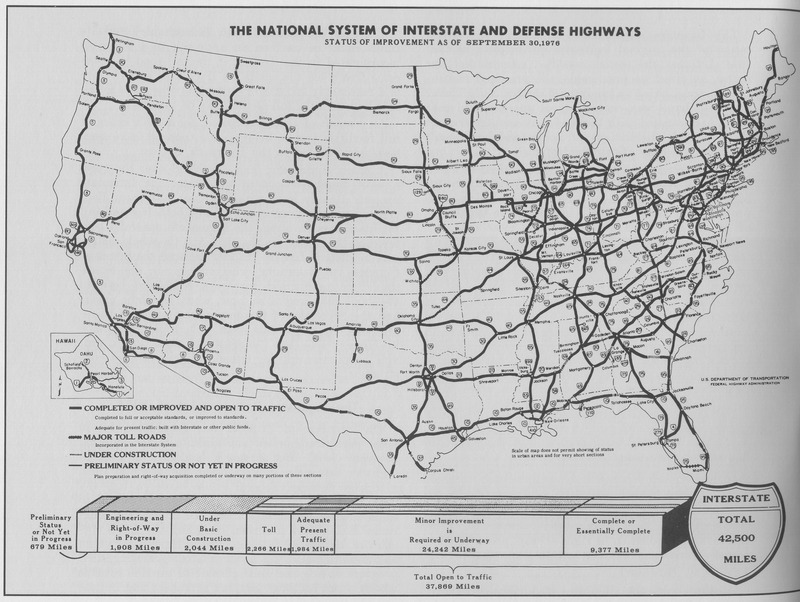 From the beginning, national planners understood that the construction of a system of interstate highways would cause major disruptions; the only question was which areas should bear the burden. To many, the answer was obvious. Studies indicate that "the victims of highway building tended to be overwhelmingly poor and black" partly because these neighborhoods occupied the cheapest land and were usually sheltered by the weakest political representation. Indeed, it seems that national planners envisioned the Highway Act as an outgrowth of the Truman-era "slum clearing" projects aimed at revitalizing cities by leveling blighted areas often occupied by the lowest-income residents. 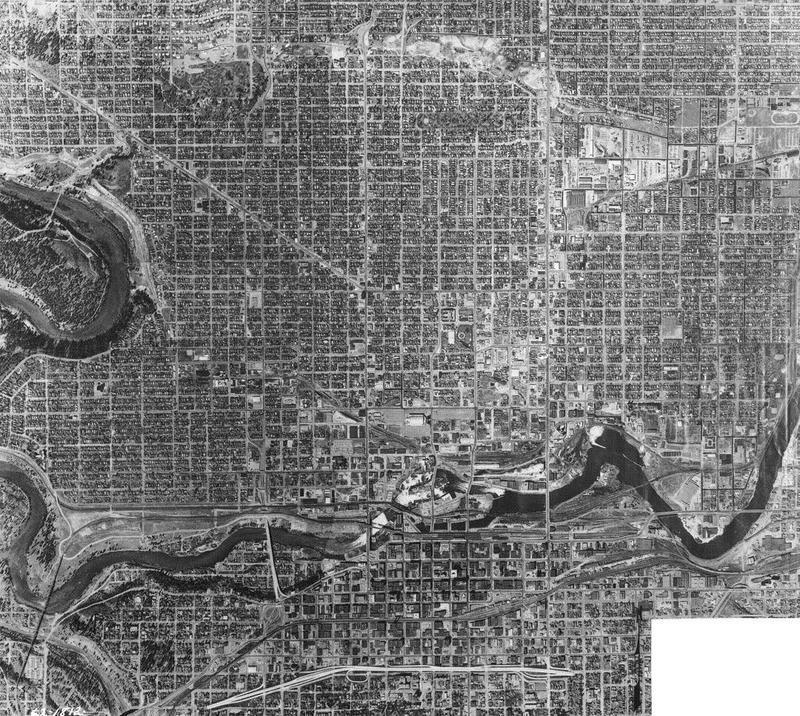 It was an easy choice to put the freeway through East Central, which was the poorest and most diverse neighborhood by the time I-90 construction began in the late 1950s. The results were devastating. 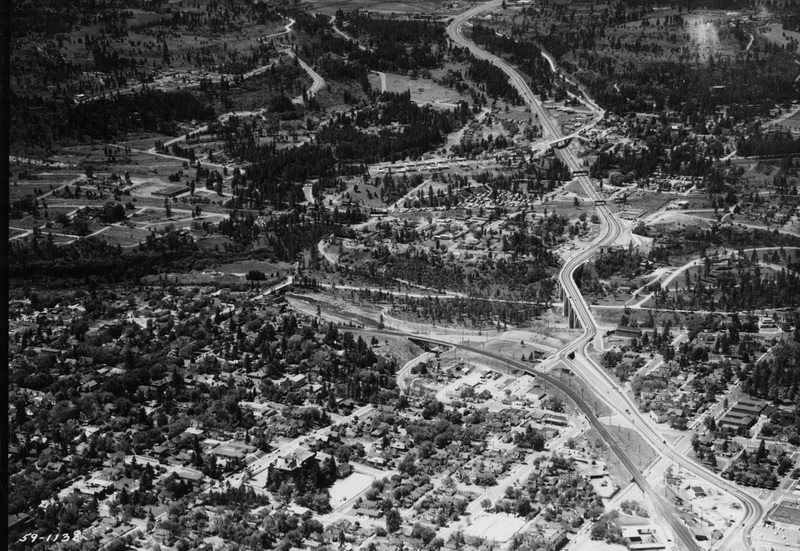 The freeway cut the neighborhood in half, and because there was no off ramp to East Central, it routed traffic from the Sprague business district to the freeway, where it traveled to points further east or west. Nearly all of the small businesses that had served the neighborhood for decades were forced to close their doors. 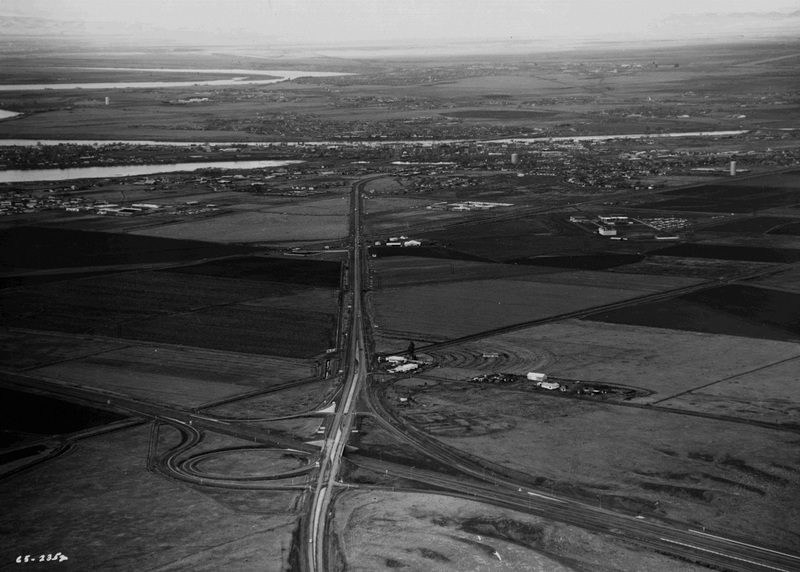 Worse still, over a thousand homes were leveled for the I-90 right-of-way. Although the federal government reimbursed displaced homeowners, they often could not afford to buy a home higher up on the hill, compelling them to relocate to other parts of the city, which simultaneously reduced the tax base and the low-income housing stock. Well-established schools closed. Liberty Park, the oldest and one of the most elaborate parks in the city, and perhaps the most popular source of recreation for East Central residents, disappeared as the freeway took 26 of its 28 acres. Culturally, the freeway essentially created two different neighborhoods, one of which (north of the freeway) was cut off from the majority of services, which were located south of the freeway. The northern part of the neighborhood continued to degrade as Sprague businesses closed one after another. It has never recovered. There are many stories to be told about the East Central neighborhood, but this oral history project, sponsored by the Spokane Regional Health Department's Neighborhoods Matter initiative, has chosen to study the impact of the I-90 freeway. The interviews below represent a range of memories, experiences, and opinions as diverse as the neighborhood itself, some emphasizing relationships or race, while others focus on businesses and politics. Whatever the specific topic, all of the interviews point to the freeway's social impact over time, a historical narrative that many people who drive the I-90 every day might otherwise never consider. Although the interviews have been carefully arranged to relate a coherent story, the listener should feel free to explore them in whatever order he or she desires. A video promoting the interstate highway, ca. 1958. Video courtesy of the U.S. Department of Transportation Federal Highway Administration. 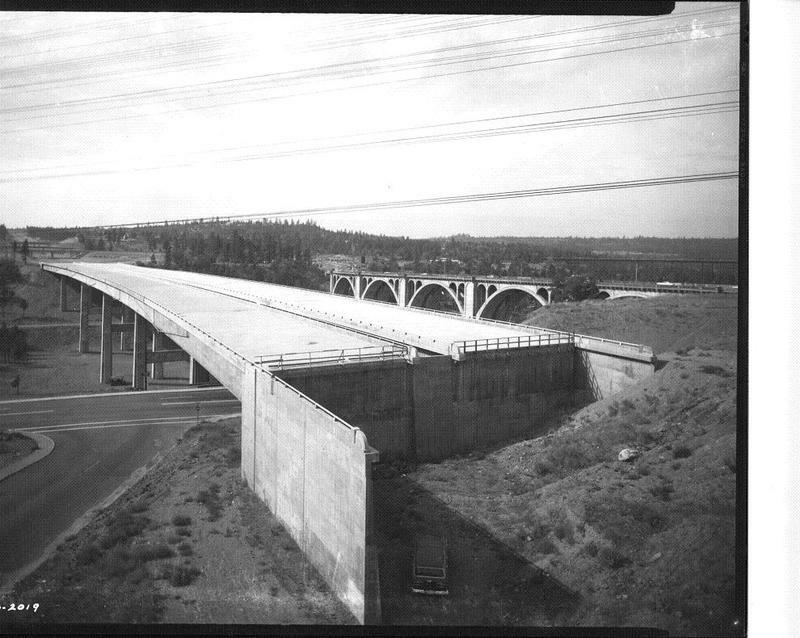 The I-90 bridge spanning Latah Creek under construction, 1964 (image L87-1.1978-64 courtesy of the Northwest Museum of Arts and Culture): This bridge is just west of downtown Spokane. Immediately east, I-90 cuts through the lower half of the South Hill. 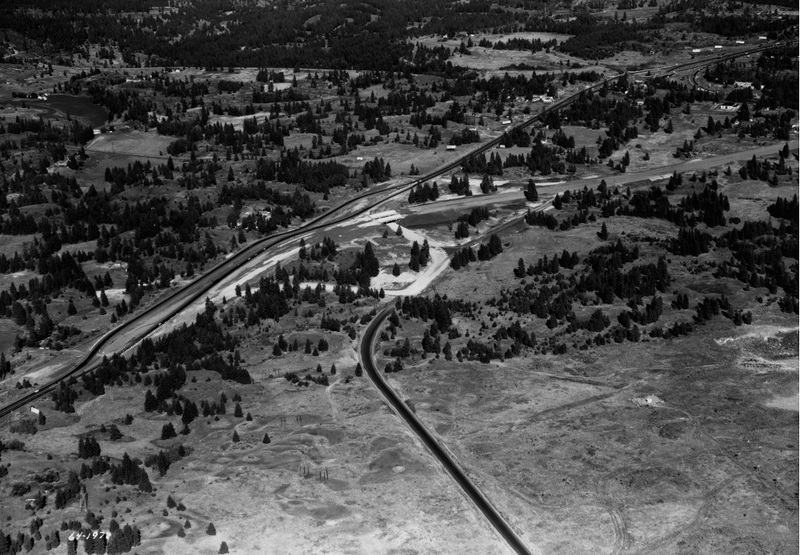 I-90 under construction, just west of Spokane, 1964 (image L87-1.1973C - 64 courtesy of the Northwest Museum of Arts and Culture): Between 1960 and 1975, interstate freeways cut a wide swath through many communities. This image makes it clear how much area was needed for the I-90 right of way. 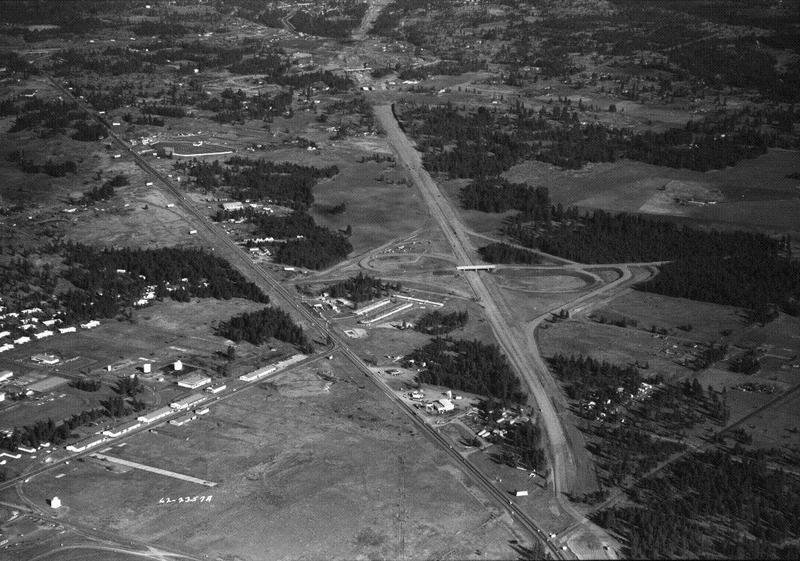 I-90 construction in west Spokane, 1962 (image L87-1.1812-62 courtesy of the Northwest Museum of Arts and Culture): This aerial view shows construction of the strip of I-90 that cut through the lower South Hill, just south of downtown Spokane. 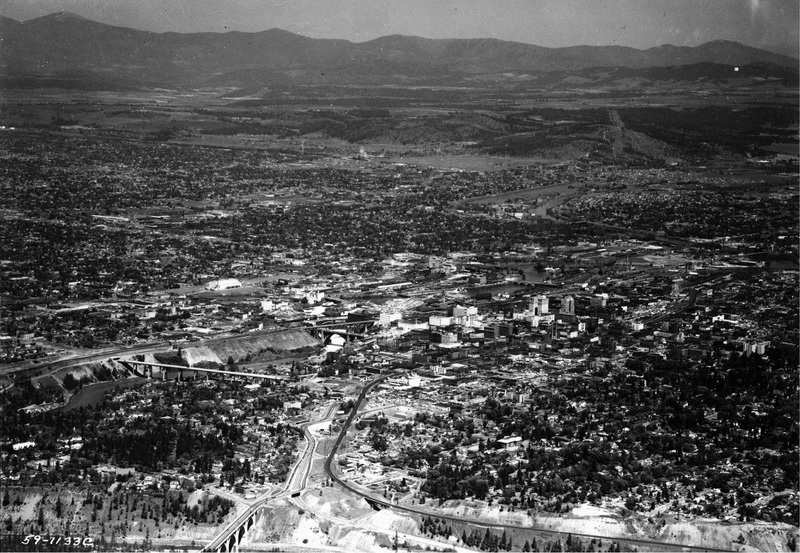 Arial view of Spokane, 1959 (image L87-1.1133C-59 courtesy of the Northwest Museum of Arts and Culture): Taken from the west looking northeast, this image shows what Spokane looked like just a few years before I-90 construction started. The freeway would cut through the lower right quadrant of the image. I-90 under construction just east of the East Central area, 1964 (image L87-1.1978-64 courtesy of the Northwest Museum of Arts and Culture): It is difficult to nail down the completion of I-90 with any precision because crews were building from the west and the east and planning to meet somewhere in the middle. 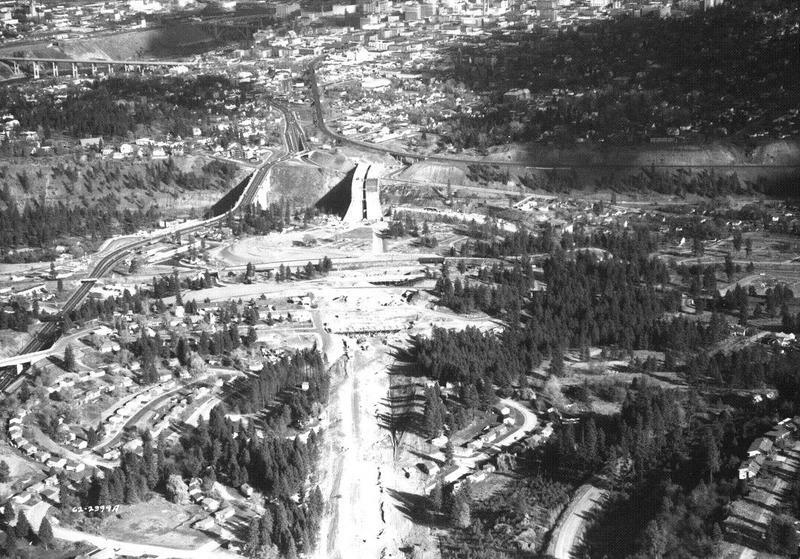 This section, for example, was under construction at the same time as the portion that ran by the South Hill. 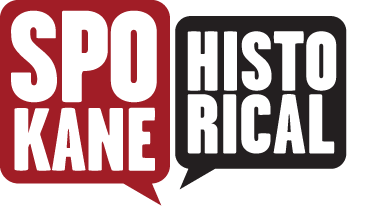 Spokane Regional Health District's Neighborhoods Matter Project, & Frank Oesterheld, “Neighborhoods Matter: The Impact of the I-90 Freeway on the East Central Neighborhood, an Oral History - Introduction,” Spokane Historical, accessed April 20, 2019, https://spokanehistorical.org/items/show/468. *U.S. Government Printing Office, "Federal-Aid Highway Act of 1956," available at http://www.gpo.gov/fdsys/pkg/STATUTE-70/pdf/STATUTE-70-Pg374.pdf. 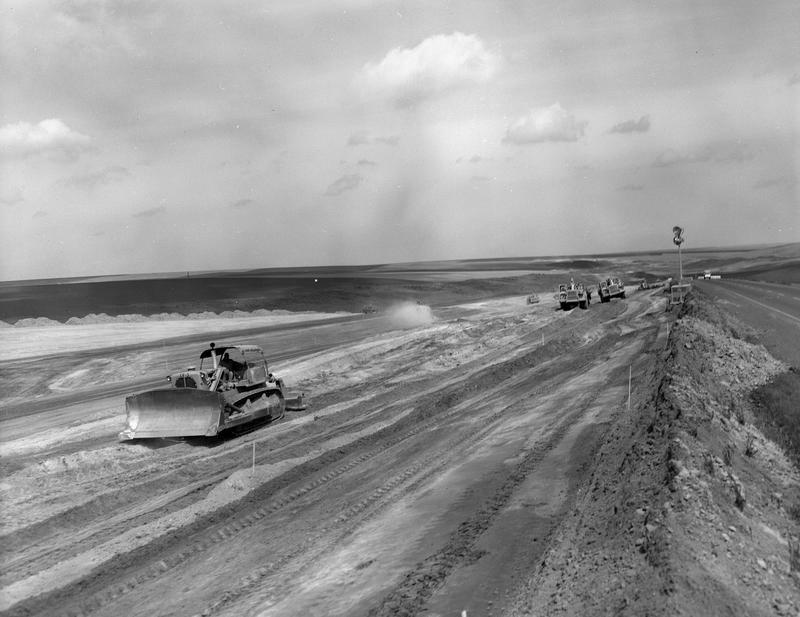 * U.S. Department of Transportation Federal Highway Administration, "History of the Interstate Highway System," available at https://www.fhwa.dot.gov/interstate/history.htm * University of Vermont, Landscape Change Program, "History and Cultural Impact of the Interstate Highway System," available at http://www.uvm.edu/landscape/learn/impact_of_interstate_system.html. *Erick Johnson, "The Evolution of Interstate 90 Between Seattle and Missoula," Eastern Washington University, October 1995, available at http://nwhighways.amhosting.net/intersta.html. *Thomas W. Sanchez, Rich Stolz, and Jacinta S. Ma, "Moving To Equity: Addressing Inequitable Effects of Transportation Polices on Minorities," a Joint Report of the Center for Community Change and The Civil Rights Project, available at http://civilrightsproject.ucla.edu/research/metro-and-regional-inequalities/transportation/moving-to-equity-addressing-inequitable-effects-of-transportation-policies-on-minorities/sanchez-moving-to-equity-transportation-policies.pdf. * Clayton Nyall, "How Interstate Highways Created Republican Suburbs," Harvard University, 2010, available at http://scholar.harvard.edu/files/nall/files/NallCh3.pdf. *Raymond A. Mohl, "The Interstates and the Cities: Highways, Housing, and Freeway Revolts," University of Alabama, 2002, available at http://www.prrac.org/pdf/mohl.pdf. * Martin V. Melosi, "The Automobile Shapes the City Core," University of Michigan, 2010, available at http://www.autolife.umd.umich.edu/Environment/E_Casestudy/E_casestudy4.htm.